Technology tools are an big asset for our day to day living. At the same time these have overtaken our lives. We have devices of all sorts, ranging from cellphones, to smart home lightbulbs, to voice activated assistants. Our tech needs a little spring cleaning and organizing too! Where the heck is the tech in your home? Go through your home and office and find what you have and where it is. Make a list of what you use and what is required of each. Label cords with the tech device name and use. Now you know what’s an older version or a duplicate. Many of us have quickly accumulated older devices as new items come on the market within a three year time frame now. If you have multiple devices that perform the same solutions, think about sending the item on it’s way to someone who can use it. There’s electronic recycling all around us. It’s the right thing to do for our environment. Be sure to clear your device of all your personal information by using the general settings. For older equipment, write the date on your calendar of local recycling. If your device is new, you can sell it and make back some of your investment. Cell phones can be donated to a charity of choice. CellPhones for Soldiers, or local community domestic violence shelters. Now that you know what you have and what’s left, it’s time to plan for storage. Choose a central storage spot in your home for technology. Ziplock together the device and cord to store for future use. Organize the devices by use, such as listening devices like airpods and ear buds or reading devices like nook and kindle. A drawer in an office, the bottom drawer of your nightstand or a basket in your office cabinet are common storage spaces. Most important is to set up a common charging spot in your home going forward. This spot is where all devices are charged overnight for a great night’s rest. Research proves repeatedly that keeping electronics away from your bedroom improves your rest. Your family will benefit too. There’s no longer the chaos of lost or borrowed cords for last minute charging or where to find your device on the way out the door. If you are adding a new device this spring, be proactive and get organized with your devices. It’s one small way to be more organized this year! An organized office is the gateway to more productivity. As in any space, the key is clear areas to work, easy access to what’s most important to use and good routines to keep your space organized. Everyone needs a good space to work. Your “desk” may be stationary or mobile. Clear what’s on your desk and put it in a box. Add back in only the tools you use every day to the desk top. Gather papers together in an “unprocessed” wall pocket near the door of your office. Drop items in there that have not been reviewed or triaged. Clear your computer or device desk top by moving documents to the document folder. Start by creating folders to house the documents. Do this 15 minutes at a time and you will feel accomplished as your desk top looks clearer and cleaner. Not enough space on your desk? Add a file cart to store papers and access these quickly. Drawers are not to just stuff away desk top clutter. Designate uses for each drawer. Top middle or top right drawer works best for immediate access items, such as less frequent tools or checkbooks. Right file drawer can be set up for frequently accessed resources. Left file drawer can be your “personal” file drawer for snacks, lotions, or extra items. Desk drawers can easily become cluttered. Add organizing trays to your drawers to see exactly where items go. A pencil tray or shallow baskets help you organized these. Keep the knee space clear under your desk. It’s easy to accumulate stuff that needs to go home. Make a point of taking home items every Friday to keep clutter away. Think vertical and think access for your bookshelves. What resources do you want to keep close and access quickly? That’s what belongs on your bookshelves. Your resources can be stored in attractive, consistent appearance notebooks with labels on the spine. Use the top shelf for knickknacks and photos. Your desk stays clear and you have a space to host family and memorable keepsakes and awards. Remember that on organized bookshelves all books are vertical or staged in a decorative array. An overpacked bookshelf means it’s time to cull out what is not useful. Organizing inside your computer is critical to your productivity. Organizing your email by general topics. Think about the areas of your work and create subfolders in your inbox to save these. Areas might be clients, vendors, or resources. These big categories save you time filing. Set specific times to work your email. Three times a day is sufficient to work through email. Add tasks and project to a task list to keep from cluttering your inbox. The word strikes horror, fear, and overwhelming feelings. Paper work takes a plan. Have a basket, wall pocket or slot for unprocessed papers. It’s the spot where paper comes as it enters the office. Having this spot keeps the paper in one area. Be deliberate and brutal about eliminating paper. Have a recycle and shred zone in your office. Paper work builds up quickly. A weekly admin time for one hour helps you keep on top of paper. 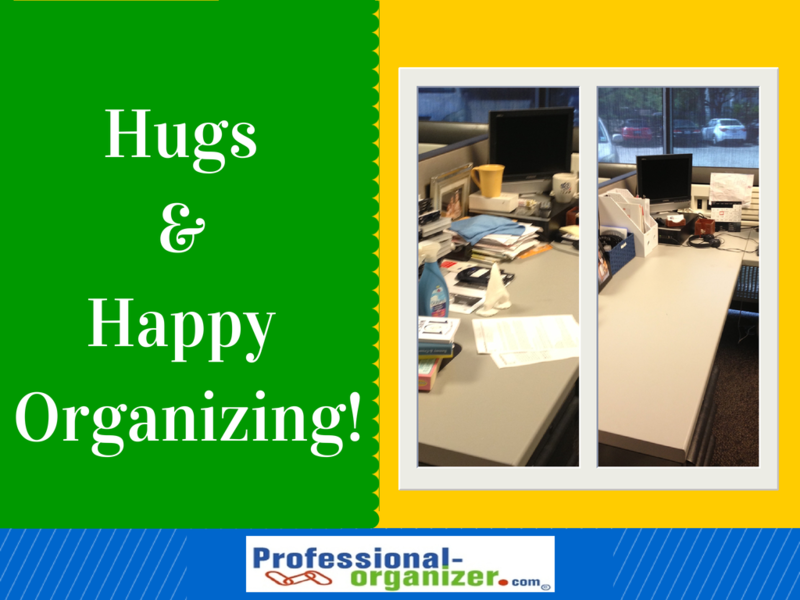 Keep your organizing success by keeping your office organized. Each evening set a timer to remind you it’s time to close up shop. Remember that time when a shop keeper turned the open sign to closed and took the money from the till to the safe? That’s what we all need to end our day. Make a list of your closing activities to get items back to their slots. Set time weekly to bring items back home to their original spots. After your annual strategic planning or at the new year, evaluate what is in your office and if it serves your purposes this year. Need help with your office? Call me! The home office has come full circle as being a prominent part of where we live, work and play. With an increase in telecommuting, the home office is a valuable piece of real estate. There’s basic set up of your home office. Make the most of your home office with these innovative home office ideas. The standing desk is a new piece of office furniture. Sitting for long periods of time have health consequences. With a standing desk that’s adjustable, you have the option of movement during the day. This innovation for some of us means we think clearer and have improved productivity. How to choose what desk? Thanks to Reviews.com, there’s great options to consider. A smaller foot print desk will also give you more space, less clutter on your work surface and more organization. We all hate all those wires and cords. It’s unattractive and unsafe. There are more options for wireless now for printing, scanning and cloud based document storage. Set up can be DIY or with an expert. Going wireless is affordable with the right tools. Our work together is fundamental and instrumental. Collaboration tools are what we need to work together on projects. Our online tools makes it easier to work together and get our work done. Tools like Trello with boards, lists, and cards help you organize and prioritize projects in a fun and visual way. It’s not a problem not being in the same space with Join.me where you can share screens. FreeConferenceCall.com gives you free phone time together. Check out these easy to access tools. These innovations make your office more functional and more efficient. Making your space easy to use and easy to collaborate create a productive environment. What’s organizing REALLY about? Working together with my clients I see two different ways we work. I also see the goals of our work in two different ways as well. Organizing while both strategies accomplish what my clients want, each process differs slightly. Here is my concept of organizing as letting go and organizing as unearthing treasures. Organizing is streamlining and letting go. You are overwhelmed with stuff. Your goal is to have less, organize it and then keep your space maintained. The first step in your organizing project is to review what you have. Then you assess it’s value. Do you use it or love it? If neither applies, it’s time to eliminate this item. As Marie Kondo says, “To truly cherish the things that are important to you, you must first discard those that have outlived their purpose.” Working on having less is often the most motivating reason to get organized. Your stuff is overwhelming you, but just culling out is not enough. Your goal is to keep what’s most valuable to you. Organizing can also be about finding and unearthing treasures. You can take the “treasure hunt” perspective where you sift through items to find what is most valuable to keep. In choosing what’s most valuable, only you can be the judge. It may be a long lost trinket or a check. Organizing can be unearthing items that have been buried in what’s not important. We found this treasure while working together! What treasures have you found while organizing? When you unearth treasures, whether it’s financial or sentimental, you find real value in organizing. Join me for fresh perspectives on organizing and productivity. Sign up for my newsletter here! Home offices are cluttered! These spaces are jammed paper, office supplies, books and more. Why not add more vertical storage to create more order. Each different category of paper needs a “slot.” Create a slot with a basket labelled for each type of paper. These categories can include taxes, small business, utilities, instruction books and other papers. Create more space by going up! With these additional bookcases, there is a basket for each type of paper. Keep your desk clear by having a slot for unprocessed, unopened or to be reviewed papers. Keep papers in notebooks or magazine sorters so these can be orderly. Editor’s note: Our work together was done virtually! Check out more Hugs and Happy Organizing stories here. Trouble getting started or knowing when to finish up? Easily distracted while working? Easy to do the short term projects but long term projects don’t get started? All these challenges can be part of ADHD. 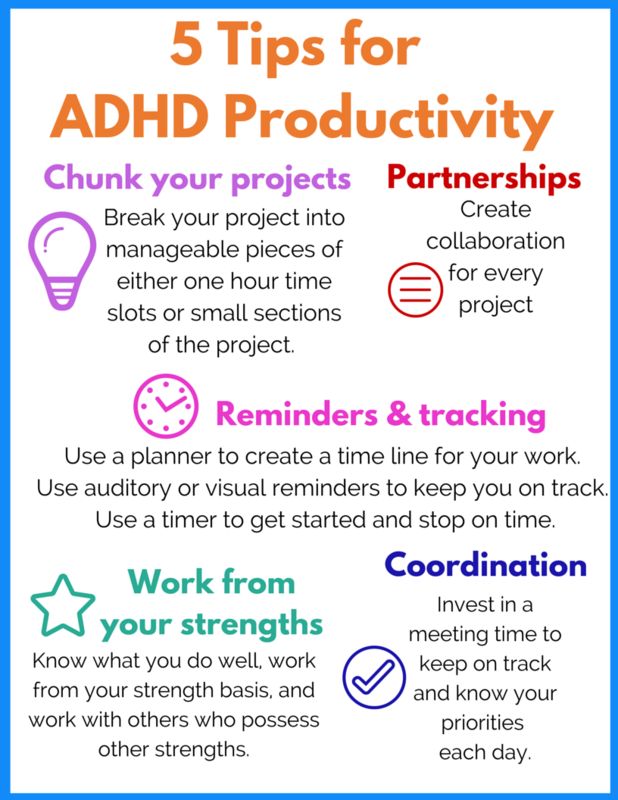 Planning or focus may not be the greatest strength for ADHD, however there are ways to be more productive at work and home. Start with trusted tools to be productive. Use a planner that works with your strengths, whether that’s a paper planner or a digital tool. If you are highly visual, a paper planner is most helpful. If you love technology, a digital planner makes a difference. Track all dates and deadlines for both home and work. Add in reminders that are both visual (dry erase board on the wall or large sticky notes) and auditory (alarms or timer) to help you stay on track. These reminders can be to help you know where you start, where you were interrupted or what is most important to tackle that day. A kitchen timer, Any.do app, or the reminder app on your phone can be ways to stay on track. A single notebook keeps all your tasks together in a single place to find these. Track your 5 most important tasks and check them off at the end of the day. Simple tracking and reminders consolidate this information. Long term projects can get lost in the shuffle. A long day without structure can be unproductive. Break your day and your projects into manageable pieces either one hour in time slots or smaller sections of the project. Smaller sections can be just one step forward in a project or several small steps that coordinate together. Structuring your day into parts keeps you from being overwhelmed and less efficient. A typical day can include a morning, early afternoon and late afternoon time frame for work periods. Add in your morning and evening routines at home and you are set up for success. Collaboration is the key to success. Working with a partner adds interest and accountability. The interaction and engagement with a partner brings energy to every project. Choose a partner who has different skills and abilities to bring about productivity. Your partner can keep you on track with weekly or bi-weekly deadlines to finish a project on time. The most positive partnerships engage and empower you in your work. The most effective plans and projects include meetings for accountability and a time line. Just like when we invite company over, we are faced with an imminent deadline. With deadlines, you will complete tasks and projects timely by that extra surge of energy. Coordination brings this all into being. Your strengths could be creativity, tech savviness, working well with others, and any number of skills and abilities. If you are unsure of your strengths, ask a colleague to reflect these back to you. Create a plan that includes these strengths. Use your strengths by choosing work aligned with these and not dwelling in negativity. Find ways to bring out your strengths in your work as well by choosing parts of the project that engage your strengths. Get started today! You may be flip flopping between multiple planners. Just choose one and use it for 2 months and assess. It can be difficult to approach your colleagues to get started collaborating and coordinating. However, this difficult step can lead to a rewarding effort that is well worth the effort. Reach out today to start your most productive year ever. Check out more tips on ADHD here on Ellen’s Blog ADD! You’ve just returned from a vacation, feeling relaxed and looking tanned, only to find a colossal pile of mail and other papers waiting for you at work. It’s easy to get overwhelmed by the volume of paper when you return. Even when you are not on vacation, 57% of workers in a recent survey by Neat reported frustration with paper and believed there are better paper management tools. What’s the best way to deal with paper after you return from a vacation? The best start requires planning and prioritizing. 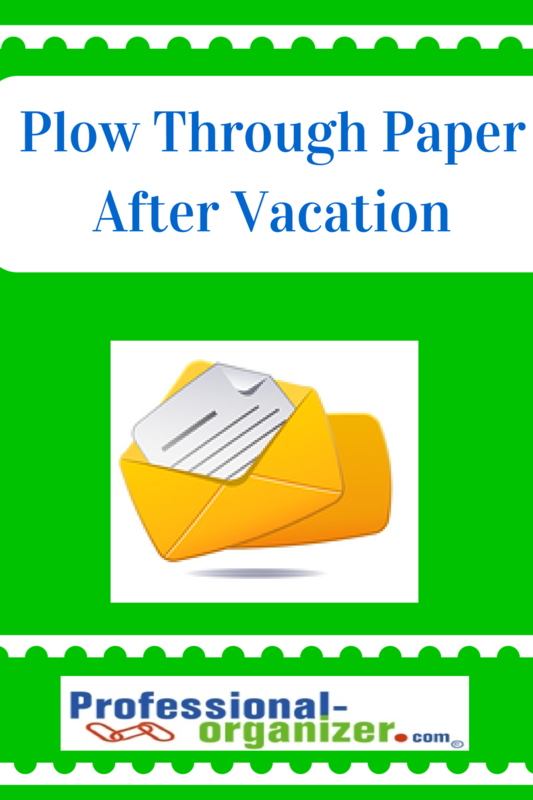 Before heading on vacation, let your team at work know and encourage them to send emails after your return. When you return, get a good night’s rest and head to the office a little earlier than usual. Your head start means you are working before others arrive and interruptions begin. Make a list of all your outstanding and upcoming tasks. Then prioritize what is immediately important and what can wait until the end of the week. Getting clarity is the best first step. There are many ways to automate your work. Set up your auto-responder before you leave to share your absence. Set up a new message for the week of your return to indicate you are back at work, slogging through paper (and email) and will not be available for meetings until later in the week. Arrange for auto pay for bills before you leave so payments are made in a timely fashion. Triage the important and urgent papers, brutally discarding others. It’s not time for the “maybe, should and what if” papers. Categorize the remaining papers into groups of Action, Pay, Scan and File and place these in your Command Center, your tool for organizing actionable papers. Create a task list for actionable items in addition. Your list will help you stay on top of projects and help you focus. Scan and digitize paper from your trip. Often on vacation we take journals and business related reading materials. We gather business cards from contacts and possibly have receipts for tax purposes. After the trip, consolidate the information, amazing brainstorming notes you had, and other scraps of paper in your Scan folder. Using your Neat Connect or Neat mobile, (sponsored post) scan these items in later in the week. Creating a digital version of these articles and papers will make these easier to file and easier to find with searchable PDF files. Scan in receipts to keep track of your expenses while on vacation and budget for your next trip. As hard as it is to return to work, having a paper plan can help. It’s never easy to get back to routines and deadlines, but having less paper makes work life better. 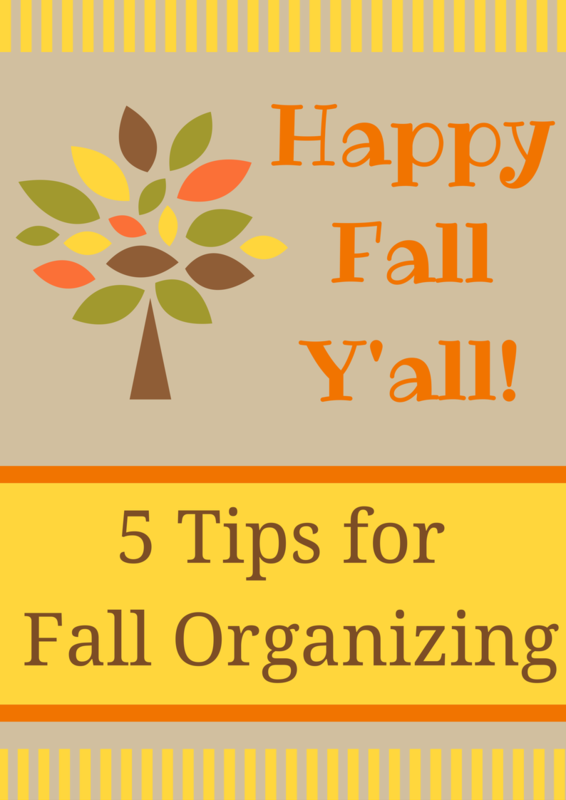 Been away and ready to get back to being organized and productive? Join my newsletter.